This is my first Cambeltown Whisky and what a real pleasure. On the nose there is toffee, honey and sea-spray with a hint of spicecake and oranges, on the palate its smooth and buttery with honey and smoke developing around the edges with a dry rich orange and oaky finish. Perfect with a with a smooth Guantanamera Cristales cigar. Noticeable surprisingly (although I consider myself a novice) was the difference in the miniature and the 70cl bottle, the former having a far more defined sea salt aroma, unless I'm all whiskey'd out having tried quite a few new malts this past couple of weeks. 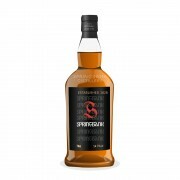 thanks I hope you enjoy your Springbank, the 10 yr is really good btw, bit more livelier, fresher and zesty..
Matt - I am enjoying a SB 18y - lovely. I am comparing to a Talisker 18 and hesitate to say but it seems much more complex and robust in comparison - though the Talisker is good - until put head to head with either SB 18 or Aberlour 18 (huge toffee/butterscotch now). I think you were the one that pushed me in this direction - so thanks!